A One-Pager is a simple, clean and distraction free website that offers users a look into your online identity – and you decide what they see. It’s a one-page site that works like a hub or online home base. These days, a lot of people are diversified with their work. For example our founding editor is a certified life and business coach, author, journalist, editor and social media expert, as well as a small biz owner. 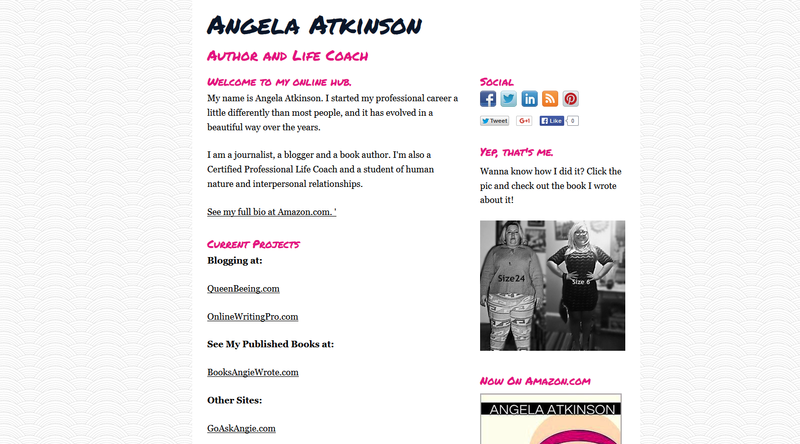 Her One-Pager, AngelaAtkinson.me, features her work from around the web and offers a one-stop portal for her potential clients, editors and other interested parties. For another example, one of our clients is both a coach and a spoken word artist. Her One-Pager website, AnitaCaprice.com, does the same for her work. Sometimes, you only need to share the niche-specific stuff with the people who are interested. But we all have moments when we need to show someone everything we do, and that’s what a One-Pager offers. It’s a cross between an online portfolio, a resume and a catch-all landing page. You can use it on a business card, or in your social media pages – it makes life much easier than having multiple URLs, social media profiles and forum memberships. A one-pager is essentially a hub that will link out to your other online blogs, websites and social media pages. You may include as much text as you like and various other types of functionality, depending on your needs. Even better, once you sign up for a One-Pager Online Hub, if you later decide to take your site a different direction or to turn it into a full-blown website with a blog, you’ll get a customized package of your choice that includes a 25 percent discount. The less is more concept is definitely at play here – it offers a simple and clean way to collect your contact info, websites, social media profiles and more in a simple and single location. If you’re just starting out, the one pager can be good for sharing basic info as well as giving yourself a home base online over which you have complete control. One-pagers also work great for online professionals who have more than one area of expertise or niche focus or who want to have a “one-stop shop” kind of showcase for their online work. If you need a full site that has multiple pages and a blog, we can do that too. In fact, we can offer several packages at varying price points that will fit every budget. Contact us for a custom quote. Ready to sign up and get your page online? Contact us to get started today! We will have you up and running in no time.